This weekend, I went to see a horror movie. It got stuck in my head, and now I can’t stop thinking about it—but not for any of the reasons you might think. The movie was Jordan Peele’s new hit Get Out, which has gotten rave reviews from critics—an incredible 99% on Rotten Tomatoes—and has a lot of people talking about its themes. Creepy, huh? You might know writer/director Jordan Peele as part of the comedy duo Key & Peele, known for smartly tackling societal issues through sketch comedy. 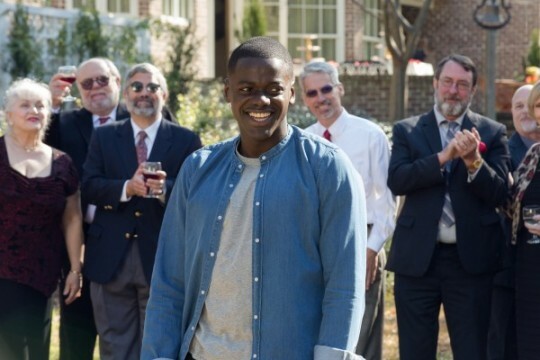 Get Out is a horror movie, but it’s also a film about race in America, and it’s impressively multilayered. I left the theater feeling deeply disturbed but glad this movie was made. I can’t say any more without revealing spoilers, so if you haven’t seen the movie yet and you don’t want to have the plot spoiled for you, stop reading now and come back later. Seriously, this is your last chance before I give away what happens. Okay, you were warned. Here we go. Our protagonist is Chris Washington, a young black man who has been dating Rose Armitage, a young white woman, for the last four months. She wants him to meet her family, but he’s hesitant. She acknowledges that her dad can be a little awkward on the subject of race, but assures Chris that he means well. After unnerving encounters with a deer (echoes of The Invitation) and a racist cop, Chris and Rose arrive at the Armitages’ estate. On the surface, the Armitages are very friendly, but the conversation (brilliantly scripted by Peele) includes a lot of the little, everyday, get-under-your-skin moments of racism that people of color have to contend with: Rose’s dad going on about how he voted for Obama, for instance, and asking how long “this thang” has been going on. Chris laughs it off to be polite, though he clearly feels uncomfortable. By the end of the film, we learn the horrible secret: Rose’s family is kidnapping and luring black people to their estate, where they’re being hypnotized and psychologically trapped inside themselves—Rose’s mom calls it “the sunken place”—so that old or disabled white people’s consciousnesses can be transplanted into their bodies. The white people are then able to move about, controlling their new black bodies, with the black person’s consciousness along for the ride as a mere “passenger.” In a shocking twist, it turns out that even apparently-sweet Rose is in on the plot, and Chris must fight her and the rest of her family to escape. This isn’t a “white people are evil” film, although it may sound that way at first, but it is a film about racism. I know many of my friends of color will connect with this movie in a way I can’t, so I won’t try to say what I think they’ll get out of it. I do want to say how I connected with it, though, because I think what Jordan Peele has done here is really important for white audiences. If you look beyond the surface horror-movie plot, this film actually gives white people a tiny peek at the reality of racism—not the epithet-shouting neo-Nazi kind of racism that white people normally imagine when we hear “racism,” but the “Oh it’s so nice to meet you; I voted for Obama” kind of racism, the subtle othering that expects people of color to smile and get along and adopt white culture as their own whenever they’re around white people. So many of the moments in Get Out are clearly intended to work on multiple levels. When Chris confronts Georgina about something being wrong and she smiles and says, “No, no no no no no,” with tears streaming down her cheeks, the symbolism is blatant. How often do people of color have to ignore the subtle indignities they face and hide their true emotions in order to avoid coming across as, for example, “the angry black woman/man”? How many times do they find themselves in social situations—even with their closest white friends!—where people make little comments tying them to an “exotic,” supposedly monolithic culture, where they have to respond with a smile and a laugh instead of telling people how stupid and offensive they’re being? I can’t tell you the number of these stories I’ve heard from my friends, and I’m quite sure that the stories I’ve heard are only a tiny fraction of the stories that could be told. So there’s something in that moment that speaks volumes about the experiences of people of color in America. The same is true for so many other moments. The black characters Chris meets at the Armitages’ have all symbolically given up their identities and conformed to white culture; when Chris meets one character, he turns out to be going under a new name, with new clothes and new mannerisms; when Chris offers him a fist bump, he tries to shake Chris’s fist. Again, within the story, there’s an explanation for all this, but every moment here is also about assimilation and culture differences. For me as a white audience member, all of these moments did something remarkable: They showed me my own culture—a culture I’m often blissfully unaware of because it’s all around me—as something alien. They reminded me that I, too, have a culture, and that expecting everyone else to assimilate to my culture is just as much an erasing of their identities as it would be to expect me to assimilate to someone else’s culture. And that’s a big part of what Get Out is about—the erasing of identities, and the power of racism to destroy people. I think it’s really significant that racism is portrayed here very differently from how it’s normally portrayed in movies written by white people. In most Hollywood movies, you know a character is racist because they shout racial epithets or make blatant statements about a certain race’s inferiority. That allows white audiences to say, “I would never do/say that, so I’m not racist!” We really don’t want to think we are. 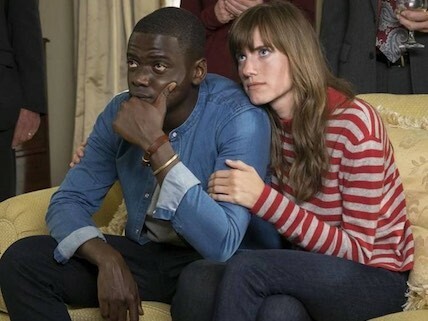 But notice something important about Get Out’s treatment of racism: This is a film about the literal enslavement of black people—racism doesn’t get more extreme than that—and yet Peele doesn’t go for the obvious by having the white characters admit that they think black people are inferior; instead, they subjugate and dehumanize people by claiming to admire things about them. They turn them into fashion accessories. When Chris asks why only black people are being targeted for this procedure, the response is telling: It’s not (supposedly) because the white characters think African Americans are bad, but rather, because they like certain things about them and they want “a change” for themselves. They want to become black—it’s trendy, we’re told!—but without having had any of the actual life experiences or history of African Americans. White people need to see this: to experience the ways in which Chris is othered by people who tell him all the things they like about him—isn’t he strong? Look at those muscles! Does he play golf like Tiger Woods? And he must be well-endowed and have such sexual prowess, right, Rose? The white people in the audience need to be reminded that just because you’re saying positive things about someone doesn’t mean you’re not being racist, that turning someone into an exotic “other” may not be the same as shouting an epithet, but it’s still taking away someone’s identity and treating them as a commodity. The film is filled with these kinds of moments. When we realize that Rose’s white grandmother has inhabited the body of Georgina, the fact that she keeps touching her own hair and admiring herself in the mirror takes on a whole new level of significance. (White people, please don’t ask to touch your black friends’ hair.) When Chris connects with a dying deer on the side of the road and later sees a deer head mounted on the wall at the Armitages’ estate, the symbolism is hard to miss. Black people are being turned into trophies in this house. And, oh yeah, they’re being literally auctioned off—as they were in real life in the not-too-distant past. One day, I’d like to see the film again to pick up on all the ways things read differently the second time through. I noticed several things in retrospect that gain new significance once you know the ending, and I’m sure there’s a lot I didn’t notice. For example, Rose’s dad says he hired Walter and Georgina to care for his parents, and when his parents died, “I couldn’t bear to let them go.” The first time you see the film, it sounds like the “them” is Walter and Georgina. But in retrospect, it’s clear the “them” he couldn’t bear to let go was his parents, so he sacrificed Walter and Georgina for them. Which, again, is an example of how the supposed care of the white characters for the black characters (his care for Walter and Georgina, Rose’s care for Chris) is really all about caring for themselves and treating the black characters as completely interchangeable objects. The message of the film isn’t simply that the black characters are “good” and the white characters are “bad.” There are presumably—hopefully—many good white people in the world of this film, and many others who wouldn’t do what the Armitages are doing but also probably wouldn’t believe Chris or make the effort to stop it. Peele’s mother and wife are both white, so he’s clearly not trying to paint all white people as villains. But I admit, as a white guy, I really, really wanted Rose to be good. I’ve been the white person in an interracial relationship introducing my black boyfriend to my family. I’ve been that. So I related to Rose, and I really wanted to believe that she was well-intentioned and just oblivious; even though she misses the mark on several occasions, there are times that she seems like she gets it and she really does listen to Chris. When a cop asks to see Chris’s ID early in the film even though he wasn’t driving, Rose stands up against the obvious racism, showing us all what it looks like for white people to do the right thing. “That was hot,” Chris says to her later, and I thought, yeah, that’s who I want to be. So I have to admit, it was really upsetting to me to see Rose, the only good white character left in the film, turn out to be evil. But I realized that part of that is that I really wanted her to represent me, and that’s really the point. Just think how often horror films have only one black character who dies early on, and how many films of all genres have no significant black characters for audience members to look up to or identify with. I think it’s really important for white audiences to experience that. As I’ve reflected on the film, it seems to me like there are three kinds of popular movies about people of color. There are those that feature POC characters that are essentially indistinguishable from the white characters—as if they just decided to cast Morgan Freeman instead of Tom Hanks without giving any thought to the character’s race. Then there are the movies that deal with racism, but in a way that allows white people to feel good about ourselves, because we’re not like the characters in the film. (This is especially true for movies about racism in the past; some of them are very important films, like Hidden Figures, which I loved, but we need to be aware that it’s still easy for white America to treat it as a feel-good film and think that we’re off the hook because we no longer have separate restrooms.) And finally, there are movies that focus more directly on the lives of people of color but tend to draw largely audiences of color; not many white people go see them, because we think they’re not “for us” (even though we assume films about white people are for everyone). Get Out isn’t any of those. It’s drawing a broad audience but it’s not afraid to make white people uncomfortable. And if you can give me, a white guy, a chance to have even a momentary fraction of an experience of the real-life, modern-day, casual racism facing people of color in America, I think that’s a very good thing.